Meet VeinDirectory.org, Now Partnered with WebMD @ VIVA! 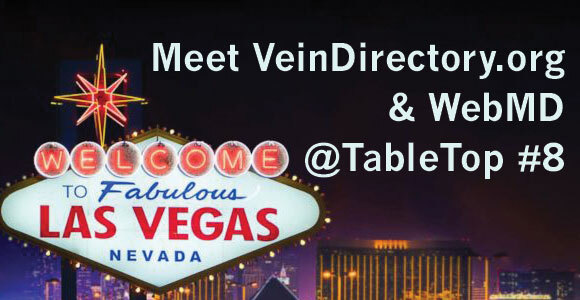 WHAT’S OFFERED: WebMD, VeinDirectory.org and VEIN Magazine will be offering $100 OFF any of our Marketing Packages when you sign up at the show! Meet us @TableTop #8. – Enter code: VIVA2018 in the form. – We will contact you within 24 hrs to schedule a time to meet with you at the show for a quick 10 min demo. If you find we are the right marketing service for you, your $100 OFF will be applied to your contract. In addition to hosting VIVA (Vascular InterVentional Advances), an annual multidisciplinary vascular education conference for physicians and healthcare professionals, VIVA Physicians also sponsors a critical limb ischemia (CLI) registry, presents the Vascular Leaders Forum, and collaborates with other industry-leading groups to move the field forward. Learn more HERE. * Discount applies to a 6 Month or Annual contract. Discount is only applicable towards newly purchased services; cannot be applied to services already in use. Discount is applicable to ANY digital marketing package tier: Silver, Gold, Platinum, or Platinum+.